A pleasant and peppy stream that loops around the posh suburban backyards of Cedarburg, Cedar Creek still offers some breaks from the large residences where paddlers will be treated with riffles, small boulders, crystal clear water, a covered bridge and a mix of hardwoods and marsh. Catching the creek with enough water to avoid scraping or walking will be a tricky challenge, however. But when the levels are right, this trip is definitely worth trekking out to. This is the recommended minimum level. To avoid scraping (and feeling frustrated), paddle this at a minimum of 6′ on the gauge. You’ll still have all the water clarity in the world but avoid bumping into the rocks. Time: Put in at 11:45a. Out at 3:20p. Wildlife: Great blue herons, bright green frogs, owls, hawks, turkey vultures, wood ducks, kingfishers, blue jays, some kind of fish, turtles and even a woodchuck. Cedar Creek had been on our to-do list for a long time. It’s just past the mark of being 90 minutes away from where we live – which is more or less our line in the sand about driving back-and-forth for a day trip (at least without camping overnight) – and the water levels of the creek are typically fickle and prone to be too shallow. That’s why it had taken us years to check it out. I thought it best to let the river levels subside and come down before I returned, not to mention being out of the way of emergency teams and highway/road workers fixing infrastructure. So I changed horses midstream, as it were, and staged myself in southeastern Wisconsin instead. Cedar Creek was one of the first streams on that list. I didn’t catch it at a great level, despite the fact that it had rained the night before and during the bike shuttle before I put-in (really, rain again? ), but it was still an enjoyable paddle. And as the photos indicate, the trip began in a light rain but ended in clear skies and sunny warmth, which was essentially wonderful! There’s not a whole lot of info or intel on Cedar Creek to begin with. What little there is tends to fall in one of two categories: either it’s the A-for-effort Treasures of Oz site, which provides good stuff within the city limits of Cedarburg itself but nothing beyond that, or it’s the risky and caveat-fraught rapids section downtown courtesy of American Whitewater. That’s all fine and good, except that some of the loveliest stretches of the creek are upstream of the famous covered bridge in Cedarburg, while nobody but dedicated whitewater paddlers and/or kayak ninjas would bother with the rapids downtown (the four dams all need to be portaged, but there is no safe way to do so shy of rappelling ropes and face paint the likes of a covert CIA operation, or stepping onto private property). While there isn’t much info out there on paddling the creek, it’s clear that folks definitely do it, given the amount of accesses there are. I chose County Road M/Country Aire Drive for no other reason than it being a public road (meaning no trespassing complaints) and that there was a discernible path of stomped grass from the road to the creek, which was a surprising but auspicious sign. I elected Boy Scout Park simply because it’s the last piece of public-access terra firma right before the first of the four dams. The access to the creek at County Road M was surprisingly inviting. There’s no landing, but the banks are grassy and low, so launching a kayak or canoe here is really easy. It’s always welcoming to happen upon a bridge over a body of water about which one knows nothing and discover that you’re not the only one who’s had this notion. The first few miles are a really pretty mix of stately oak trees and marshy cattails in a wooded corridor. Here and there the treeline will thin out to reveal a backyard or two, but this is offset with an occasional riffle and boulder to dodge. The clarity of the creek is fantastic, and it has all the look and feel of a classic glacial stream. Shortly after the first bridge at County Road Y/Granville Road, the creek will run parallel to and feet away from cleverly named Cedar Creek Road. There is an easy-to-miss access here, for point of reference, before the next bridge at County Road NN/Washington Avenue. When we paddled this, there was a large logjam on the upstream side of the Washington Ave bridge, but there was a clear passage past it on the far left. It’s a little riffly here, too, but there was nothing dangerous about this section. If the water is higher and the pushier, you may wish to scout this bridge first, just to make sure there’s a way to get through. Just after the bridge you’ll see a restaurant/bar called The Hub on the right. The landscape will continue to alternate between residential, light agriculture and undeveloped wetlands. But the peppy gradient will keep you attuned to the creek. Great wildlife takes your eye off the broad side of a barn or ostentatious estate as well. The only obstruction we encountered was just downstream from the bridge at Koehler’s Mill Road. It wasn’t too menacing, so we spent 20 mins sawing off a safe passage through it. From there it’s only 2/3 of a mile to the famous covered bridge. The bridge itself is picturesque, of course, but it’s distracted by a modern bridge at Covered Bridge Road, which is literally 20’ away from the historic covered bridge. The best views of the historic bridge are on the downstream side of it, looking upstream (if you’re paddling this in the late afternoon, you’ll be facing west and into the sun, FYI). There’s a public park here called – you guessed it – Covered Bridge Park, where there’s access to get out to take some pictures or have a picnic. We don’t recommend ending the trip here, as there’s a lot of pleasant paddling to be had past this point. The creek is protected (at least visually) from the brunt of agriculture and residential development for the next couple miles. After the second time you pass under a bridge at Cedar Road there’s an actual landing on the right called Cedar Creek Farms public canoe launch. If you were to take out here, you’d shave off about three miles. Alternatively, there’s yet another designated access point about 1.5 miles downstream from here at Grafton Lions Park, this one on the left, just after the Highway 60 bridge. While you are getting closer to downtown, and therefore more houses, the banks are still mostly undeveloped, the surroundings tree-canopied and lovely. The riffles are at their liveliest here, too – meaning really shallow in low water! The effects of the flowage caused by the first dam aren’t felt until the very end, which is great. The backwater definitely takes on a marsh feel at this point, but the tufts of wild rice are pretty cool. Eventually you’ll see the dramatic horizon line. The easy take-out is on the left at a concrete pad at Boy Scout Park. Parking is nearby on the street. The Fermentorium (a super-fun place that makes really tasty suds). There you go, three great places to wet your whistle. Almost as many as the damn dams… Ok, I’ll round up by adding the craft beer maven haven liquor store, Otto’s, just south of downtown and well worth the stop. You won’t be able to see it from the water, but immediately after putting in at County Road M you’ll pass a quarry on the left. When we paddled it, the noise was clanky and loud. But it was short-lived at least. There’s a lot of private property along the banks too. This was not surprising, given the area. And it’s not all super-developed. (There are several stretches along this entire trip with a real feeling of wild and being away.) But depending on where you’re coming from, Cedar Creek may be a long drive to paddle past stately houses and Mcmansions. Needless to say, I could’ve done without the dams. I mean, seriously, 1-2-3-4 dams in 1.3 miles? Sure, I more or less understand their original function, and let’s say that one is still used for hydropower these days – a plaque downtown indicates that Cedarburg is one of 2,000 communities nationwide that owns and operates its own utilities. But the days of milling barrels of flour are over (unless that’s part of bringing jobs back and making America great again; there were Trump yard signs all over the place). I suspect that the dams are there still to “preserve” the look and feel of Cedarburg. It is a historic place, and it’s quaint as hell (a little touristy, sure, but quaint as hell). Just the same, the lack of accesses around the dams is alarming and frustrating. Pretty sure it’s not altogether legal either. Cedar Creek is a navigable stream, and there has to be a means of portaging around a dam. Except that there isn’t. It’s not the 1850s anymore, even if some of the buildings are. Blocking access for paddlers downtown is a bit like saying all smart phones and motor vehicles shall be banned; only rotary phones and horse-drawn carriages shall be permitted. 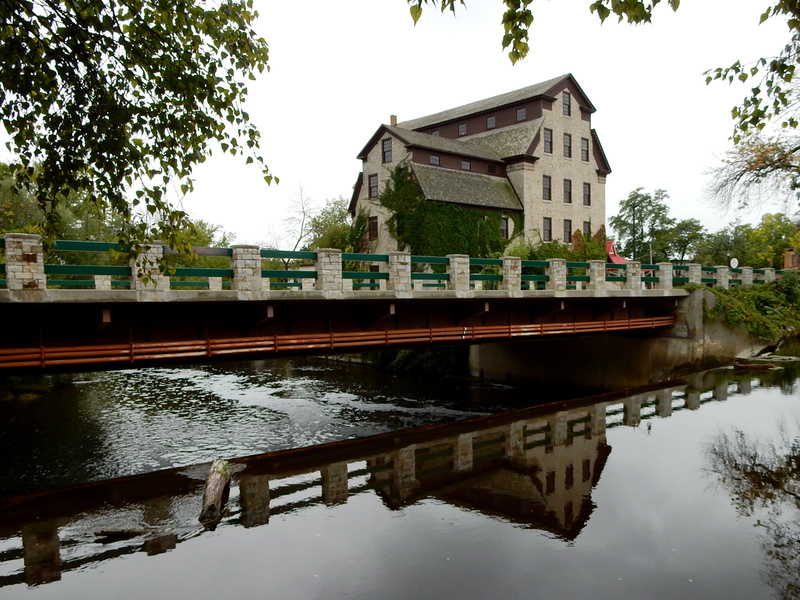 Cedarburg absolutely could be a premier whitewater destination in Wisconsin – and be all the more alluring for its old buildings and historic charm. These things don’t have to be mutually exclusive. Why can’t tourism include more recreation and less glazed pottery and custom cupcakes? We would definitely do this trip again, but only in higher water. In fact, a couple weeks after this trip we returned to check out the three miles upstream of County Raod M, starting at County Road G/Division Road, at the eastern boundary of the Jackson Marsh. There’s nothing mind-blowing about this section, but it’s quite nice and definitely undeveloped. One can make a long day by putting-in here and taking-out in town, or shaving off some miles at the end by taking out at Grafton Lions Park or at the Cedar Creek Farms public canoe launch. Additionally, after paddling the County Road G to County Road M segment, we drove down to check out the last few miles of Cedar Creek by putting in at County Road T/Lakefield Roadd to the Milwaukee River confluence and taking out at County Road C/Pioneer Road, a distance of 3.5 miles. These mini-trips don’t really constitute their own reports, although they do make pleasant paddles if you have only a couple hours to be on the water. The latter segment especially, as there are umpteen Class I rapids and riffles before merging onto the big river. At some point, at least one of us will be dumb and stubborn enough (i.e., Timothy) to paddle the downtown whitewater section, if only to keep our rogue/guerilla cred. But that’ll have to wait awhile. Once we do, then we’ll talk more about this contentious section. 6.6 miles. No notable hills. Washington Avenue is pretty busy, but the other roads aren’t. For bicycling, this was totally fine. The put-in at County Road M/Country Aire Road. Weird, random pipe just below the put-in bridge. Pretty wooded corridor lining the banks. A little ledge adding some riffly fun. There’s a lot of landscape variety for what is otherwise a suburban paddle trip. The creek can be really shallow, so be sure to catch it with enough water to avoid scraping. And try to catch it on a sunny day to appreciate the clear water. Some of the stately buildings you’ll see along the way. A modest obstruction we cleared a passage through. Covered Bridge Road bridge in front of the historic covered bridge. The covered bridge from the downstream side. An attractive pedestrian bridge in Covered Bridge Park. Minus the houses and farms, most of the creek paddling looks like this. One of many small boulders you’ll be dodging along this trip. Cedar Creek Farms Put-In/Take-Out off Robin Court/ Cedar Creek Road. One of many stately estates you’ll pass. But then you’ll slip away from it all into such fun confines as this. Backwater impoundment caused by the first dam near the take-out. The “lake effect” from the dam is pretty minimal. The rather notable horizon line at the first dam. It’s hard to tell, but that’s over 10’ tall – and why you need to take out before this. The developed access at Boy Scout Park in downtown Cedarburg. The take-out at Boy Scout Park. This is at the 2nd dam at Columbia Road. This old mill is 5 stories tall! On the bottom level is the strangely named but otherwise awesome Silver Creek Brewing Co. The attractive Interurban Trail bridge in between the first two dams. Teaser photo of the rapids section between dams two through four.